In what would become the most publicized war atrocity committed by U.S. troops in Vietnam, a platoon slaughters between 200 and 500 unarmed villagers at My Lai 4, a cluster of hamlets in the coastal lowlands of the northernmost region of South Vietnam. 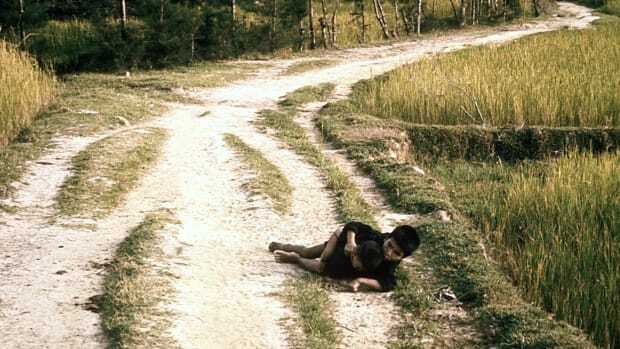 My Lai 4 was situated in a heavily mined region where Viet Cong guerrillas were firmly entrenched and numerous members of the participating platoon had been killed or maimed during the preceding month. Lt. William L. Calley, a platoon leader, was leading his men on a search-and-destroy mission; the unit entered the village only to find women, children, and old men. Frustrated by unanswered losses due to snipers and mines, the soldiers took out their anger on the villagers. During the ensuing massacre, several old men were bayoneted; some women and children praying outside the local temple were shot in the back of the head; and at least one girl was raped before being killed. Others were systematically rounded up and led to a nearby ditch where they were executed. Reportedly, the killing was only stopped when Warrant Officer Hugh Thompson, an aero-scout helicopter pilot, landed his helicopter between the Americans and the fleeing South Vietnamese, confronting the soldiers and blocking them from further action against the villagers. The incident was subsequently covered up, but came to light a year later. An Army board of inquiry investigated the massacre and produced a list of 30 persons who knew of the atrocity. Only 14, including Calley and his company commander, Captain Ernest Medina, were charged with crimes. All eventually had their charges dismissed or were acquitted by courts-martial except Calley, who was found guilty of personally murdering 22 civilians and sentenced to life imprisonment. His sentence was reduced to 20 years by the Court of Military Appeals and further reduced later to 10 years by the Secretary of the Army. Proclaimed by much of the public as a “scapegoat,” Calley was paroled in 1974 after having served about a third of his 10-year sentence.